Although communication problems of this kind must happen thousands of times each day, very few become public knowledge. Publicity comes only when a failure to communicate has major consequences, such as strikes, lost orders, legal problems, or fatal accidents - even, at times, war. One reported instance of communication failure took place in 1970, when several Americans ate a species of poisonous mushroom. No remedy was known, and two of the people died within days. A radio report of the case was heard by a chemist who knew of a treatment that had been successfully used in 1959 and published in 1963. Why had the American doctors not heard of it seven years later? Presumably because the report of the treatment had been published only in journals written in European languages other than English. Several comparable cases have been reported. But isolated examples do not give an impression of the size of the problem — something that can come only from studies of the use or avoidance of foreign-language materials and contacts in different communicative situations. In the English-speaking scientific world, for example, surveys of books and documents consulted in libraries and other information agencies have shown that very little foreign-language material is ever consulted. Library requests in the field of science and technology showed that only 13 per cent were for foreign language periodicals. Studies of the sources cited in publications lead to a similar conclusion: the use of foreign- language sources is often found to be as low as 10 per cent. The language barrier presents itself in stark form to firms who wish to market their products in other countries. British industry, in particular, has in recent decades often been criticised for its linguistic insularity — for its assumption that foreign buyers will be happy to communicate in English, and that awareness of other languages is not therefore a priority. In the 1960s, over two-thirds of British firms dealing with • non-English-speaking customers were using English for outgoing correspondence; many had their sales literature only in English; and as many as 40 per cent employed no-one able to communicate in the customers' languages. A similar problem was identified in other English-speaking countries, notably the USA, Australia and New Zealand. And non-English-speaking countries were by no means exempt - although the widespread use of English as an alternative language made them less open to the charge of insularity. The criticism and publicity given to this problem since the 1960s seems to have greatly improved the situation, industrial training schemes have promoted an increase in linguistic and cultural awareness. Many firms now have their own translation services; to take just one example in Britain, Rowntree Mackintosh now publish their documents in six languages (English, French, German, Dutch, Italian and Xhosa). Some firms run part-time language courses in the languages of the countries with which they are most involved; some produce their own technical glossaries, to ensure consistency when material is being translated. It is now much more readily appreciated that marketing efforts can be delayed, damaged, or disrupted by a failure to take account of the linguistic needs of the customer. The changes in awareness have been most marked in English-speaking countries, where the realisation has gradually dawned that by no means everyone in the world knows English well enough to negotiate in it. This is especially a problem when English is not an official language of public administration, as in most parts of the Far East, Russia, Eastern Europe, the Arab world, Latin America and French- speaking Africa. Even in cases where foreign customers can speak English quite well, it is often forgotten that they may not be able to understand it to the required level - bearing in mind the regional and social variation which permeates speech and which can cause major problems of listening comprehension. In securing understanding, how 'we' speak to 'them' is just as important, it appears, as how 'they' speak to 'us'. Complete each of the following statements (Questions 1-4) with words taken from Reading Passage 2. Write your answers in boxes 1-4 on your answer sheet. 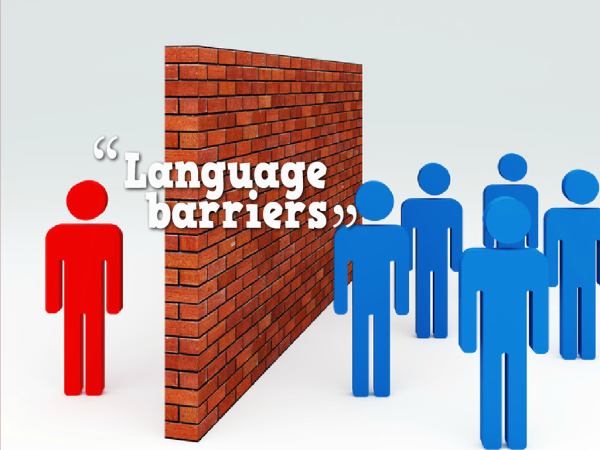 1 Language problems may come to the attention of the public when they have , such as fatal accidents or social problems. 2 Evidence of the extent of the language barrier has been gained from of materials used by scientists such as books and periodicals. Choose the appropriate letters A-D and write them in boxes 5-7 on your answer sheet. 6 The case of the poisonous mushrooms (paragraph 2) suggests that American doctors . Choose the appropriate letters A-D and write them in boxes 12 and 13 on your answer sheet.